Santa’s origins can be traced all the way back to pagan beliefs about spirits who traveled through the skies in the darkest part of winter, and to St. Nicholas, a 4th century bishop who lived in Turkey and was credited with various miracles, many of which involved children. After he died, he became known as the patron saint of children, sailors, and unmarried girls, and was celebrated with a feast day in December. Over the years, St. Nicholas eventually evolved into Santa Claus. Originally, Santa wore a variety of colours, but the red-and-white colour-scheme eventually became the most widely accepted because these colours were already associated with Christmas (the white of snow and the red of holly berries, as well as the red bishop’s robes worn by the original St. Nicholas). Some have attributed Santa’s colours to a well-known Coca Cola marketing campaign, but these colour associations were already established by the time St. Nick was portrayed as a Coke drinker. The idea of Santa riding a sleigh comes from a dream of Washington Irving, author of The Legend of Sleepy Hollow. The writer described this dream in his 1819 short story collection, The Sketch Book of Geoffrey Crayon. 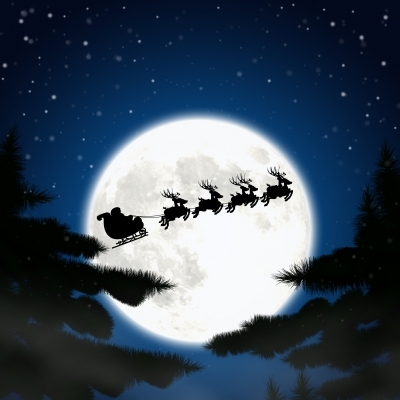 The image of Santa riding a sleigh through the sky was then popularized by Clement Moore’s 1822 poem, A Visit from St. Nicholas (which was renamed The Night Before Christmas in 1823). When crafting his Santa Claus character, Moore incorporated elements from Nordic legends of a cheerful, elfin man who featured prominently in the midwinter pagan celebration. The reindeer that appeared in Moore’s poem came from the Sami, indigenous people of Finland and Scandinavia who rode on sleighs pulled by reindeer. However, the idea of reindeer pulling Santa’s sleigh became entrenched in the public imagination as a result of promotional activities undertaken by a savvy businessman named Carl Loman. Reindeer were brought to Alaska via Siberia and Norway in the mid 1800s due to the efforts of an Alaskan missionary named Sheldon Jackson. Jackson wanted to help the Inuit, who were starving as a result of commercial overfishing of whales (the Inuit’s primary food source) to meet the rising demand for whale oil. Jackson hoped to shift the local economy to reindeer herding by introducing reindeer to Alaska and having the Sami provide instruction to the Inuit regarding their care. Carl Lomen, who saw the commercial potential of mass-marketing reindeer meat and fur in the U.S., developed a promotional campaign in 1926 that included a parade featuring Santa and a sleigh pulled by reindeer. He also created fake children’s letters requesting that Santa and his reindeer visit their towns, and these letters were published in local newspapers. Despite this clever marketing campaign, Lomen was ultimately unsuccessful, as the cattle lobby ensured that reindeer meat never became a staple in the U.S., and the right to own reindeer was eventually confined to indigenous Americans only in 1937. In subsequent years, other people contributed to the Santa Claus lore, including a cartoonist called Thomas Nast, who created a series of Christmas images for Harper’s Weekly. This series depicted Santa living in the North Pole, building toys in a workshop, and maintaining a record of which children had been naughty or nice. Rudolph, the Red-Nosed Reindeer, was created by Robert L. May, who developed the character as part of an advertising campaign for the Montgomery Ward department store. Rudolph was introduced in a poem as a misfit reindeer who saves Christmas. Although the company retained the rights to the Rudolph character, in a surprising act of generosity, it turned them over to May when he fell into poverty due to his wife’s ultimately fatal illness. May’s brother-in-law, Johnny Marks, later wrote the popular Rudolph, the Red-Nosed Reindeer, song, and Rudolph also featured in a Christmas special in 1964, providing May with much-needed financial security. For more on the history of Christmas traditions and symbols, as well as gift and food ideas for the holiday season, see the main Christmas page. A&E Television Networks. (2015). History of Christmas. History.com. Galloway, L. (2012). How Santa Got His Reindeer. CNN.com. Krystek, L. (2003). AKA Santa Claus. The Museum of UnNatural Mystery. UNMuseum.org.